Can a single experiment do all of the following? Apparently it can! BICEP2 is a radio telescope experiment located at the South Pole, taking advantage of the very cold, dry air at that remote location for greater sensitivity. It is focused on measuring polarization of the cosmic microwave background radiation that is a remnant of the hot Big Bang of the early universe. (BICEP is an abbreviation of Background Imaging of Cosmic Extragalactic Polarization; this is the second version of the experiment). The results announced by the BICEP2 team on March 17 at the Harvard-Smithsonian Center for Astrophysics, if they have been correctly interpreted, are the most important in cosmology in the 21st century to date. They are of such enormous significance that a Nobel Prize in Physics is highly likely, if the results and interpretation are confirmed. We infer from a number of previous observations that there was likely an inflationary period very early on in the universes’s history. We are talking very, very, early – in the first billionth of a trillionth of a trillionth of a second. 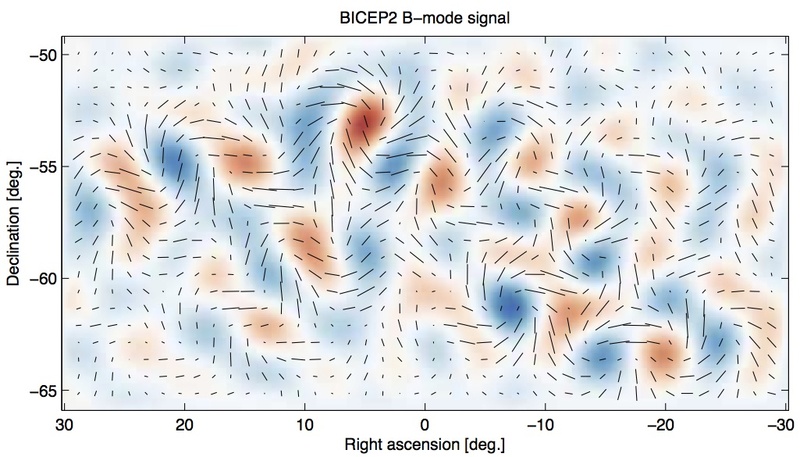 See this earlier post of mine here: https://darkmatterdarkenergy.com/2011/03/22/inflation/ This new result from BICEP2 is very supportive of inflationary Big Bang models, and that includes very simple models for inflation. What is the observation? 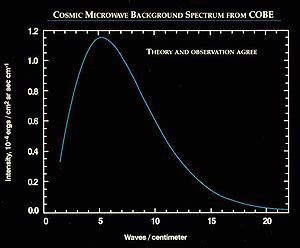 It is B-mode polarization in the cosmic microwave background radiation. The cosmic microwave background (CMB) is the thermal radiation left over from a time when the universe became transparent, at age 380,000 years, almost 14 billion years ago. There are two polarization modes for alignment of CMB radiation, the E-mode and the B-mode. The B-mode measures the amount of “curliness” in the alignment of CMB microwave photons (as you can easily see in the image below). There are two known causes of B-mode polarization for the CMB. The first, also detected by the BICEP2 experiment, is due to intervening clusters of galaxies along the line of sight. These clusters bend the light paths due to their immense masses, in accordance with general relativity. These effects are seen at smaller spatial scales. At larger spatial scales, we have the more significant effect, whereby the gravitational waves generated during the inflation epoch imprint the polarization. What is being seen in today’s CMB is due to this second and more profound cause, which is nothing less than quantum fluctuations in space-time in the very, very early universe revealing themselves due to the gravitational waves that they generated. And these gravitational waves in turn caused a small curling effect on the cosmic microwave background, until the time of decoupling of radiation and matter. This is seen in the image at angular scales of a few degrees. 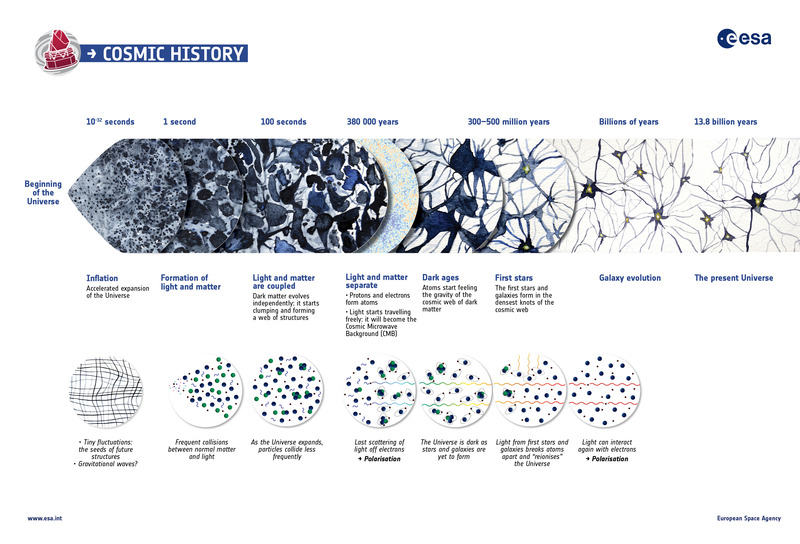 At age 380,000 years the universe became transparent to the CMB radiation and it traveled for another 13.8 billion years and underwent a redshift by a factor of 1500 as the universe expanded. So what was optical radiation at that time, becomes microwave radiation today, with a characteristic temperature of 2.7 Kelvins (degrees above absolute zero), while still retaining the curly pattern seen by BICEP2. This is the first observation that provides some direct insight into extremely high energy scales within the context of a single experiment. We are talking here of approximately a trillion times higher energy than the Large Hadron Collider, the world’s most powerful particle accelerator, where the Higgs boson was discovered. The BICEP2 results are a single experiment that for the first time apparently ties quantum mechanics and gravity together. It supports the quantum nature of gravity, which occurs at very high energy scales. The Planck scale at which space-time would be quantized corresponds to an energy level of 10^18 or 10^19 GeV (ten million trillion GeV), and inflation in many models begins when the universe has an energy level somewhat lower, at 10^16 GeV (ten thousand trillion GeV, where 1 GeV is a little more than the rest mass-energy of a proton). And take a look at this interview of Sean Carroll by PBS’s Gwen Ifill to get some more context around this (hopefully correct!) universe-expanding discovery. Other astronomers are already racing to confirm it. This video reports on a very impressive research effort resulting in the first 3-D mapping of dark matter for a galaxy cluster. A massive galaxy cluster over 5 billion light-years from Earth is the first to have such a full 3-dimensional map of its dark matter distribution. The dark matter is the dominant component of the cluster’s mass. The cluster, known as MACS J0717, is still in the formation stage. The Hubble Space Telescope and a number of ground-based telescopes on Mauna Kea in Hawaii were used to determine the spatial distribution. The longest filament of dark matter discovered by the international team of astronomers stretches across 60 million light-years. Gravitational lensing of galaxy images (as Einstein predicted) and redshift measurements for a large number of galaxies were required in order to uncover the 3-D shape and characteristics of the filament. 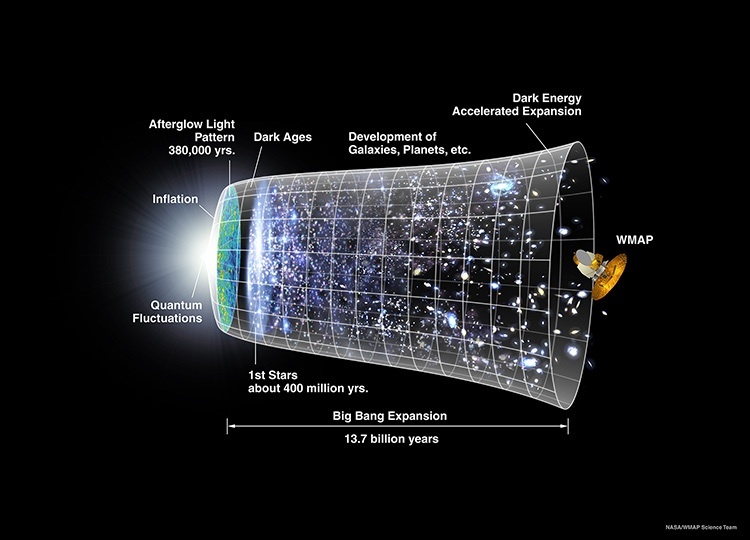 The Big Bang theory found great success explaining the general features of the universe, including the approximate age, the expansion history after the first second, the relative atomic abundances from cosmic nucleosynthesis, and of course the cosmic microwave background radiation. And it required only general relativity, a smooth initial state, and some well-understood atomic and nuclear physics. It assumed matter, both seen and unseen, was dominating and slowing the expansion via gravity. In this model the universe could expand forever, or recollapse on itself, depending on whether the average density was less than or greater than a certain value determined only by the present value of the Hubble constant. However, during the late 20th century there remained some limitations and concerns with the standard Big Bang. Why is today’s density so relatively close to this critical value for recollapse, since it would have had to be within 1 part in 1000 trillion of the critical density at the time of the microwave background to yield that state? 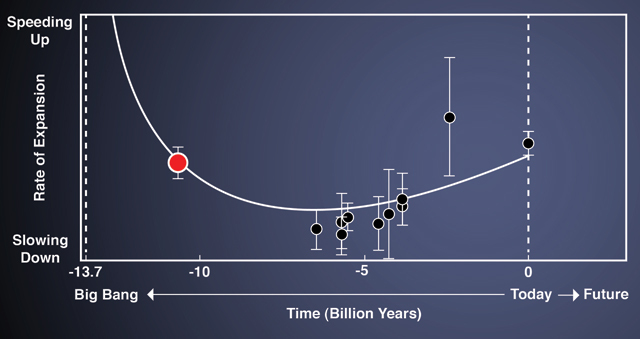 How did galaxies form given only the tiny density fluctuations observed in the microwave background emitted at the age of 380,000 years for the universe? And why was the microwave background so uniform anyway? In the standard Big Bang model, regions only a few degrees away from each other would not be casually connected (no communication even with light between the regions would be possible). There are four known fundamental forces of nature. These are electromagnetism and gravity and two types of nuclear forces, known as the strong force and the weak force. Physicists believe all the forces but gravity unify at energies around 10,000 trillion times the rest mass-energy (using E = mc^2) of the proton (1 Giga-electron-Volt). At some point very early in the life of the universe, at even higher energies equal to the Planck energy of 10 million trillion times the proton mass, all of the four forces would have been unified as a single force or interaction. Gravity would separate from the others first as the universe’s expansion began and the effective temperature dropped, and next the strong force would decouple. We also must consider the vacuum field, that represents the non-zero energy of empty space. Even empty space is filled with virtual particles, and thus energy. At very early times the energy density of the vacuum would be expected to be very high. During the very earliest period of the development of the universe, it could have decayed to a lower energy state in conjunction with the decoupling of the strong force from the unified single force, and this would also have driven an enormous expansion of space and deposited a large amount of energy into the creation of matter. In the inflationary Big Bang model postulated by Alan Guth and others, the decay of the vacuum field would release massive amounts of energy and drive an enormous inflation (hyperinflation really) during a very short period of time. The inflation might have started one trillionth of one trillionth of one trillionth of a second after the beginning. And it might have lasted until only the time of one billionth of one trillionth of one trillionth of a second. But it would have driven the size of the entire universe to grow from an extremely microscopic scale up to the macroscopic scale. At the end of the inflation, what was originally a tiny bubble of space-time would have grown to perhaps one meter in size. And at the end of the inflationary period, the universe would have been filled with radiation and matter in the form of a quark-gluon plasma. Quarks are the constituent particles of ordinary matter such as protons and neutrons and gluons carry the strong force. The doubling time was extremely short, so during this one billionth of one trillionth of one trillionth of a second the universe doubled around 100 times. In each of the 3 spatial dimensions it grew by roughly one million times one trillion times one trillion in size! This is much greater than even Zimbabwe’s inflation and happens in a nearly infinitesimal time! The inflationary period drove the universe to be very flat topologically, which is observed. And it implies that the little corner of the universe we can observe, and think of as our own, is only one trillionth of one trillionth of the entire universe, or less. There is good observational support for the inflationary Big Bang model from the latest observations concerning the flatness of the universe, given that the mass-energy density is so close to the critical value, and also from the weight of the evidence concerning the growth of original density fluctuations to form stars and galaxies.